We are in Haslemere today, a town in Surrey, England, and near West Sussex. 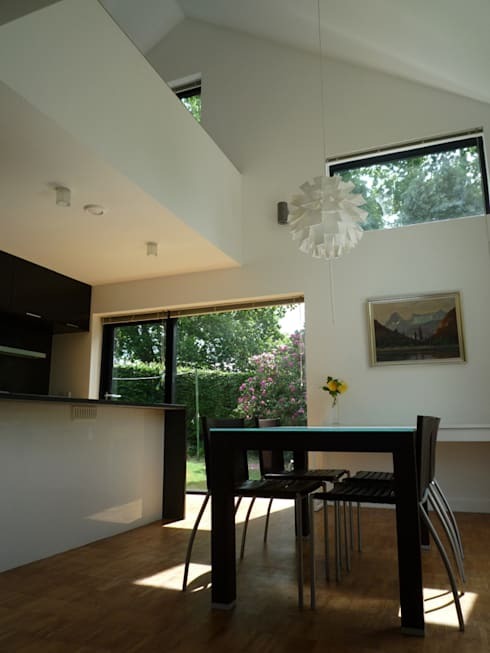 And this refurbished home built in the 60s has attracted our attention with its elegant designs and modern extension. Initially, it had cramped rooms and was not very well-connected to the garden. Signs of ageing and neglect had ruined its original charm as well. 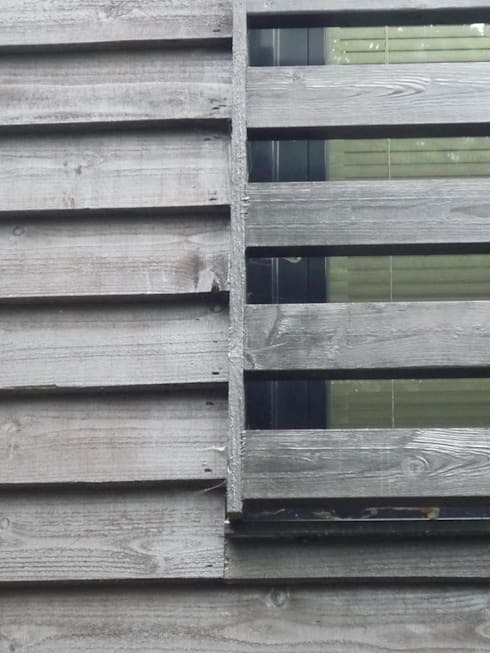 But thanks to the renovation executed by the architects at Architecture Live, this house is now enveloped on the outside with super-insulated timber cladding, so that interiors stay cosy and warm. 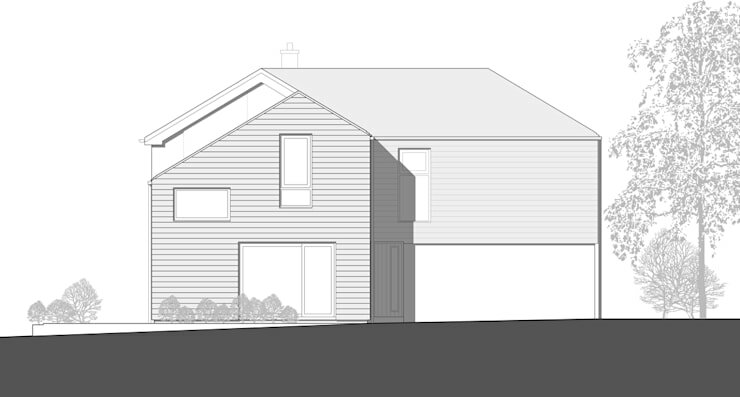 The double-height extension comprises of an open plan kitchen and dining, a study and a master bedroom with bathroom above the garage. Large glass windows, a south-facing terrace and a kitchen garden in the east ensure that the property receives ample sunlight and features beautiful outdoor spots for relaxation. 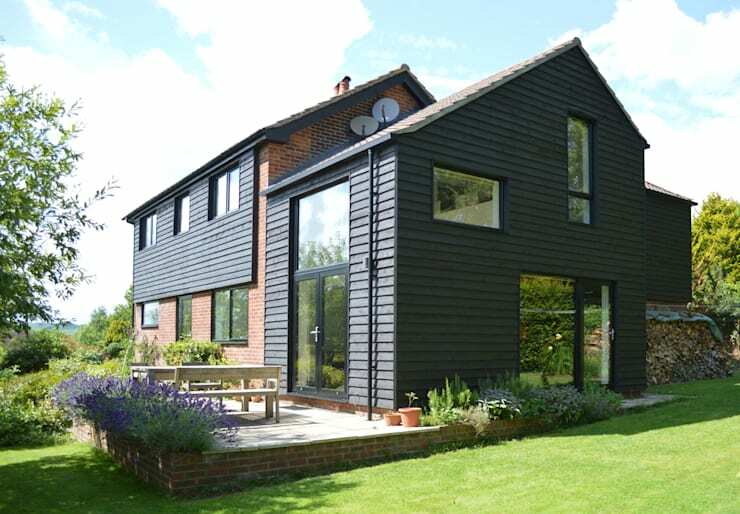 Super-insulated timber cladding painted black lends lots of boldness and character to the exterior walls of this house. Sloping roofs keep the countryside vibe alive, while large glass windows allow sunlight to flood the interiors. 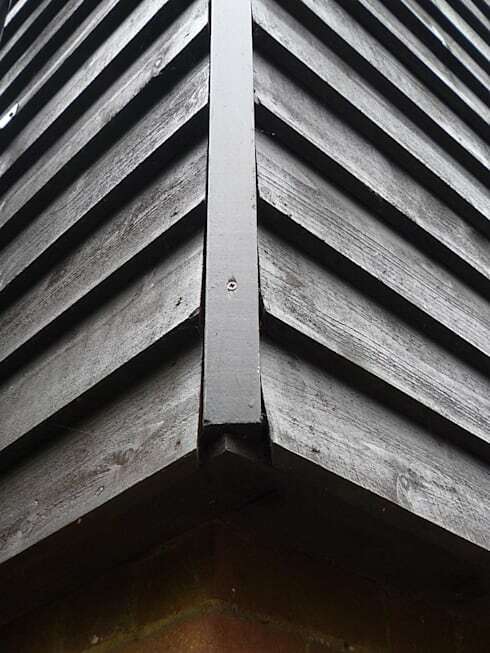 Entirely clad in timber painted black, the east side elevation of the house makes a bold statement against the gorgeous green lawn. 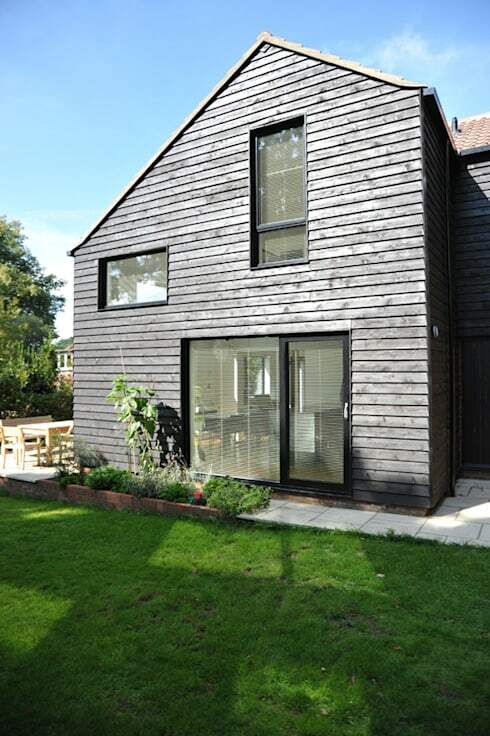 It resembles traditional West Sussex barns, while modern and large windows set in black frames help the interiors to stay sunny during daytime. Beautifully paved, the patio has been equipped with sturdy and weather-resistant furniture which is perfect for relaxing, sunbathing and relishing outdoor meals. Dense and lush vegetation make this a refreshing spot, while exposed red bricks in some places on the walls lend a rustic touch to the setting. 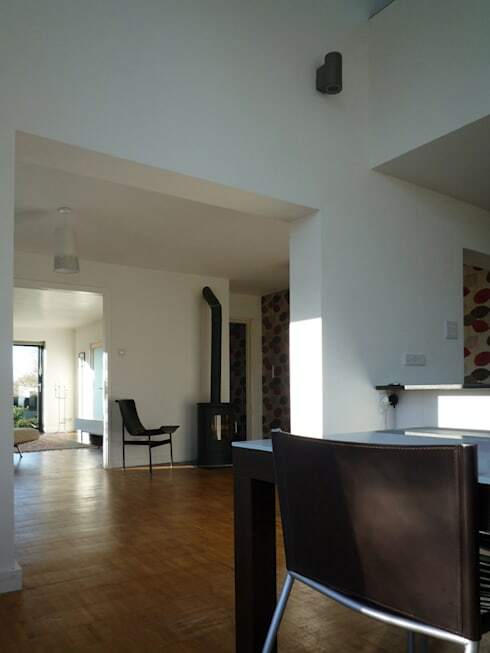 As mentioned before, the extension comes with an open plan kitchen and a double-height dining space rendered in cosy neutral tones. 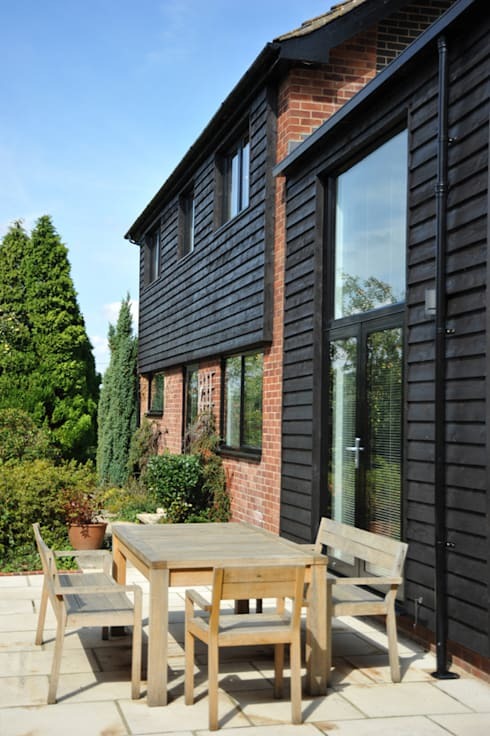 The dining furniture is minimal and trendy and stunning views of the garden can be enjoyed from here. Smooth black cabinets make a bold and very contrasting statement against the otherwise white environment of the open kitchen. 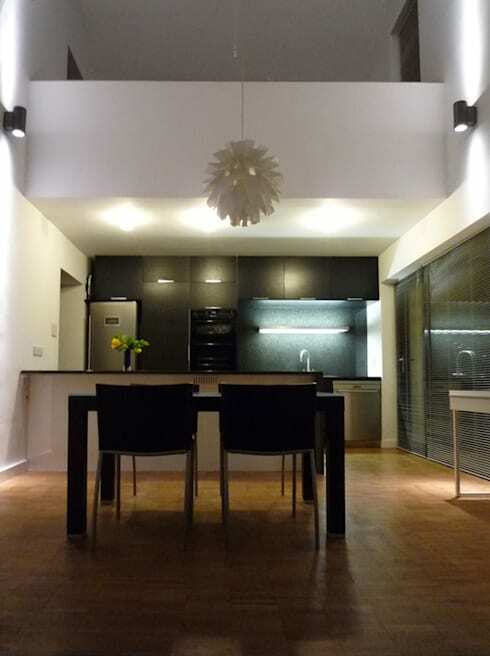 Powerful trendy lights make working here easy, while modern appliances take care of all urban needs. Note how the original parquet flooring has been restored to ensure warmth here. 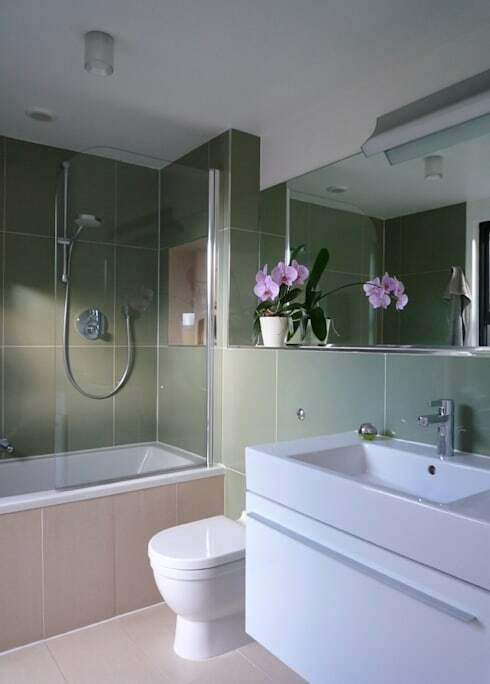 Modern white sanitary wares, large grey porcelain tiles and a massive mirror make this family bathroom look bright, spacious and soothing. A single potted green lends natural refreshment. 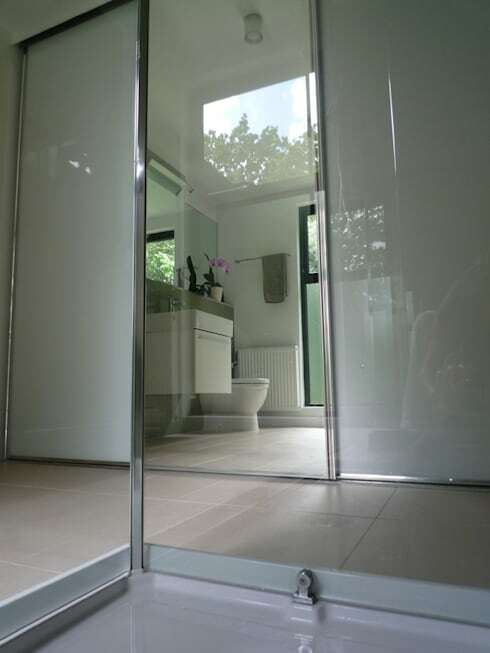 A floor to ceiling glass window and a large mirror help this ensuite shower and dressing room to remain flooded with sunlight throughout the day. The colour palette is soothing and light too.